Thinlabs introduces Dual Screen PoE Computers – two full screens (available in 19", 22"& 24") AND a Quad Core CPU powered over a single Ethernet Cable. Thinlabs world-first Dual Screen PoE Solution runs off a single PoE (IEEE’s 802.3bt or Cisco’s UPoE) port and uses less than 60W – with one cable, and less than one-third of the power for a similar legacy set up, the Thinlabs Dual Screen PoE Solution is the green solution of the future! 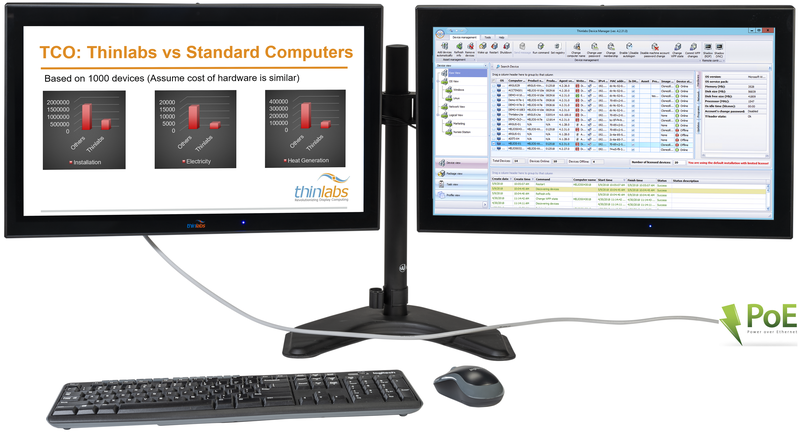 Ideally suited for Financial Services, Healthcare, Back office operations, Education and Government verticals, Thinlabs Dual Screen PoE Computers not only reduce clutter but both capital and operational costs (including simplified electrical infrastructure, reduced energy consumption, lower HVAC costs and consolidated UPS backup systems), with potential payback in 3 years when compared with legacy systems.